The penultimate day of the 2019 LCK spring split’s third week began with a battle against relegation. Afreeca Freecs and KT Rolster, two of the LCK representatives at the 2018 World Championship, now find themselves fighting to escape the bottom of the standings. KT came out on top with a sweep as AF now find themselves in a relegation spot. But without a doubt the second series of the day was the main event. Griffin and SANDBOX Gaming, the only teams still undefeated this split, fought for the championship lead. Griffin’s perfect run came to an end with a game 2 loss, but the summer split runner-ups won the series 2-1 to keep their undefeated 6-0 record at the top of the standings. Lee “Spirit” Da-yoon was back at support, although Afreeca went with a slightly more conventional Fiddlesticks pick. AF used its bottom lane priority to invade their opponent’s jungle, but KT turned it into a three versus two fight as No “SnowFlower” Hoi-jong (Thresh) hit a perfect Death Sentence on Spirit and secured the first kill. Afreeca got the bonus gold for the first turret, but the team made a bad trade as KT secured two towers almost at the same time. AF bad decision making became evident when the team committed its five players to a tower dive in the bottom lane. 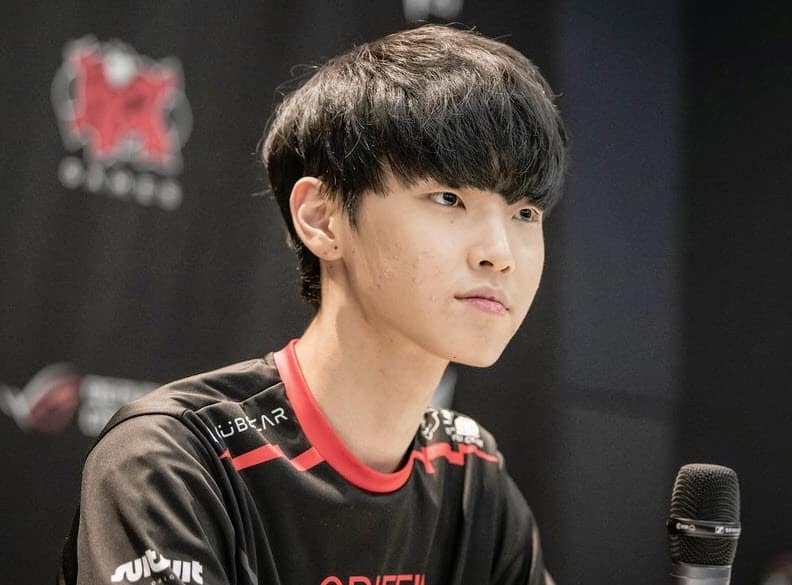 Eom “UmTi” Seong-hyeon (Kha’Zix) was the only casualty on KT’s side as the team collapsed onto the low health Afreeca players to score an ace. At the 24 minute mark, the reigning LCK champions secured the Baron buff and reduced Afreeca’s side of the map to the inhibitor turrets while opening a solid 10,000 gold lead. With the second Baron in play, KT caught Afreeca jungler Lee “Dread” Jin-hyeok (Kayn) out of position as Jeon “Zenit” Tae-gwon (Lucian) immediately bursted him down. Spirit also got taken down as KT used the men advantage to go for the objective. AF tried to face-check it only to get aced by their opponents. With a clean path to the Nexus, KT closed out game 1 to open the score. Gwak “Bdd” Bo-seong gave the recently buffed Aurelion Sol its 2019 debut. And the mid laner was Afreeca’s first target with an early gank from Dread (Camille) as the jungler secured the first blood. Dread rotated the entire map with an aggressive early game as Afreeca soon built a small lead. Even though AF held the lead in kills, KT did a better job with the macro, destroying the first turret on the top side. Afreeca’s line of outer turrets fell as its small lead soon evaporated. With two kills in the mid lane, KT set up a Baron call 26 minutes into the game. Dread came close to stealing the objective, but UmTi (Nocturne) smited it in time. Zenit (Cassiopeia) was the only casualty on KT’s side as the other four walked away with the buff. Kingen (Sion) split towards the bottom side and Afreeca saw that as an opportunity to force a 5 versus 4 fight. Dread tried to go for the engage on UmTi but got bursted down almost immediately. Kingen arrived with his Ultimate on and hit for the reengage as KT had little trouble winning the fight. Following a clean ace, the summer split champions went for the Nexus to finish the series. Griffin caught Kim “OnFleek” Jang-gyeom (Lee Sin) trying to invade its side of the jungle and Jeong “Chovy” Ji-hoon (Akali) went after the SANDBOX jungler. Son “Lehends” Si-woo (Shen) joined in for the side of Griffin while Kim “Dove” Jae-yeon (Galio) tried to help OnFleek. In the end, the Shen Ultimate was a difference-maker. Griffin’s support picked up the kill, while Dove made it a one-for-one trade by taking down Lehends. The LCK leaders had a dominant early game, winning the CS battle in the three lanes and also picking up more kills. 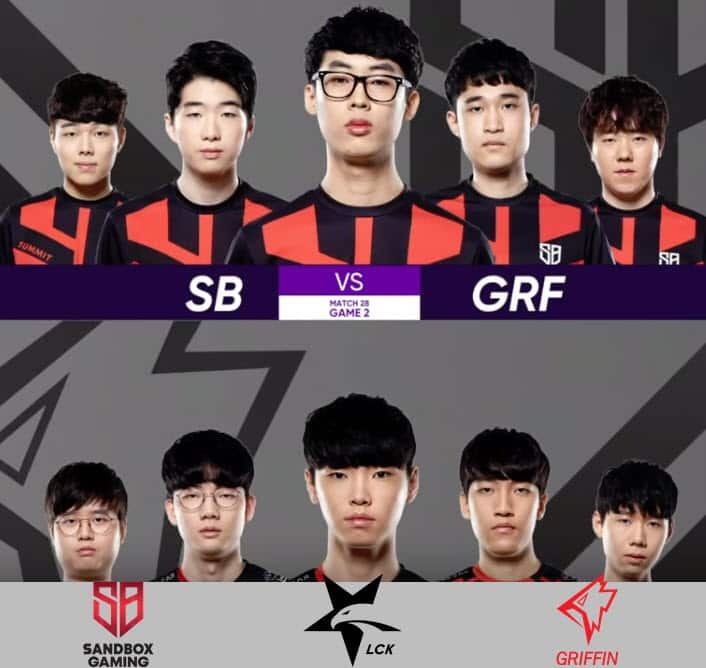 The first turret bonus however went SB’s way as GRF committed three players to take down Park “Summit” Woo-tae (Aatrox) on the top side while SANDBOX happily traded their top laner for the bottom tower. Griffin’s better laning phase paid dividends. The team quickly turned the push in its favor, destroying SANDBOX’s outer turrets to control the Baron pit. A fight broke out in the mid lane and Lehends was the first one to go down, giving SB the advantage. But OnFleek went deep into Griffin’s backline and quickly got bursted down. With the SANDBOX players separated, GRF secured a kill on Jang “Ghost” Yong-jun (Cassiopeia) and Chovy won a two versus one trade to add another one to the count. Griffin used the advantage to go for Baron. SANDBOX tried to compensate with a Mountain drake, but Griffin decided to contest it and scored an ace, with Lehends being the only loss. With no one left to defend SB’s base, GRF pushed in through the bottom lane and quickly brought the first game of the series to an end. 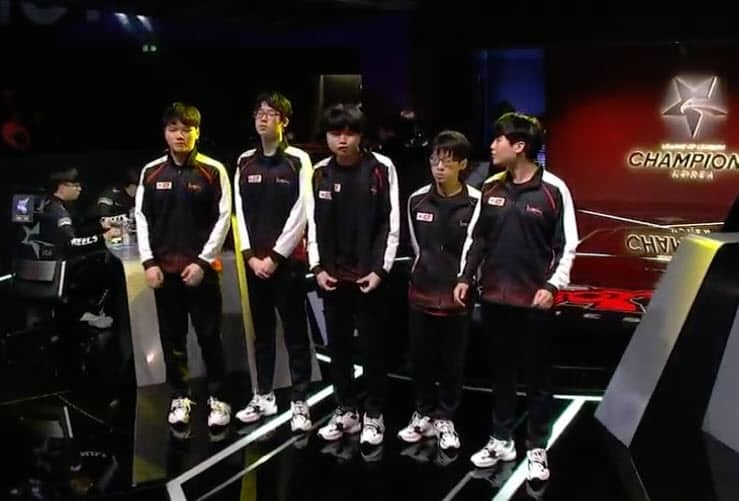 SANDBOX had the better start this time, with the first blood going their way as Lehends face-checked a bush in which both OnFleek (Lee Sin) and support Cho “Joker” Jae-eup (Galio) were hidden. The map was under SB’s control as the LCK newcomers destroyed the three outer turrets on GRF’s side. SANDBOX snowballed its top laner Summit (Akali), which allowed the team to look for pickoffs. SB also piled up four elemental buffs, securing yet another win condition as it continued to push in the three lanes. Sword couldn’t deal with Summit’s split push, which created plenty of openings for SANDBOX to explore around the map as Griffin had to dedicate at least two players to deal with SB’s top laner. Playing cautious, SB finally went for Baron at the 34 minute mark and easily secured the buff. With Griffin’s base already down one inhibitor in the mid lane, SANDBOX pressed in from the top side. A teamfight broke out as GRF desperately tried to defend the base. A beautiful outplay by Chovy drew Summit into the Fountain to take him down. But Ghost (Lucian), Dove (Cassiopeia) and OnFleek continued to deal some heavy damage. SB ultimately came out on top of the dragged-out fight as Dove and OnFleek were the only ones left standing. SANDBOX’s jungler closed things in style as he finally managed to take down Chovy (Le Blanc) taking credit for the second kill on Griffin’s mid laner at this point of the split. In the end, Chovy’s impressive KDA peaked at 119 (53/1/66), which without a doubt will remain as the record for a very long time. SB handled Griffin its first loss of the split and forced the tiebreaker. OnFleek (Nocturne) went for an early invade but Lee “Tarzan” Seung-yong (Olaf) and Sword (Sion) collapsed onto him. Chovy (Zoe) roamed from the mid lane to collect the kill and open the score for Griffin. Sword got his revenge for game 2 and dominated Summit (Aatrox) in lane, giving his team the priority for the Rift Herald. It was also the case for the other two lanes, as GRF took control just like in game 1. SANDBOX tried to pickoff Chovy in the mid lane as Griffin’s star player almost stepped into the turret range. Tarzan and Lehends (Tahmk Kench) showed up to help as Chovy walked away. Griffin turned the fight around, picking up two kills. Viper (Lucian) won a one versus one trade against Ghost (Viktor) to add another one to the count. With the mid lane defenseless, Griffin released the Herald. They made it all the way to the inhibitor turret, taking down the tier 2 tower as well. SB was forced into defending its base as Griffin quickly grew its lead. With the Baron already up, SANDBOX was forced out of its base. A fight broke out and GRF came out on top with a clean ace, securing an uncontested objective. SB still tried to mount a last stand, but Griffin brushed them off and secured another clean ace. The LCK leaders put their first loss of the split behind and closed out the series to keep its spot at the top of the standings.